This is a picture from the message board. I just put it back up after I took it down. I hope the animal rights nuts respect it, because the profanity and threats were bothering my wife. I see the what happened to the horse in this picture. If you look, you can see that the horse was caught by one leg.The same thing happened to the horse I have always conceded had to be put down because of an accident in mangana. Out of almost 1000 times I’ve seen a horse dropped, only that horse was had to be put down. That was over 15 years ago. I’ve never said that horses were not hurt in mangana. Just that it is safer then steeple chase and cross country and not any more dangerous the jumping, polo and racing. Horses are hurt in any equestrian events. Just like over 50,000 children are hospitalized and between 5 and 10 are killed each year in high school athletics. Any time you have a physical sport, there is danger. The fact is people and animals get hurt in rodeo, jumping, polo, racing, steeplechase, and cross country. But, there is no proof of the repeated and horrific injuries that the opponents of mangana say happen. 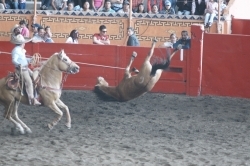 There are a number of people who say that the injuries in rodeo, and the other events are accidents. That is what this picture is It is an accident. If that horse had been caught by both legs, it would have dropped, then gotten up and trotted away. The whole tradition of charreada is one of animal husbandry. For centuries, the Mexican has been herdlng cattle and caring for horses. The Texas cowboys learned their trade from them. It was a hard and dangerous life. That is the tradition that charros want to preserve.